Be like Harry Potter with a new way to experience the world created by J.K. Rowling. The PlayStation Move has long been the red-headed stepchild of the motion controllers from the big three hardware makers. But Sony is confident they can leverage the augmented reality capability of the PlayStation Eye and the fidelity of the Move controller to offer something unique. And a combination of a new peripheral called the WonderBook, and new material from fantasy author J.K. Rowling - she of Harry Potter fame - might just be that special sauce. Sony promises the WonderBook is a new way to experience stories, and the first title Book of Spells will teach young wizards how to cast some of Harry Potter's famous incantations. You'll be able to try it out this fall. The WonderBook and Book of Spells "captures the imagination in a way never seen before." The book is bound with blank paper, but using the camera of the PlayStation Eye, the TV will display it in front of you as if it were illuminated with writing and drawings. Some of that writing will be contributed by J.K. Rowling herself as the Book of Spells will tell some of the humorous or tragic tales behind some common spells such as levitate and the fire-making spell. The demonstration of four regular people trying to get the augmented reality to work was definitely live, because there were more than a few hiccups. One lady couldn't get the unlock charm to work for what seemed like 5 minutes. Finally though, a door in the WonderBook "opened" and we learned the right incantation for "incendio". 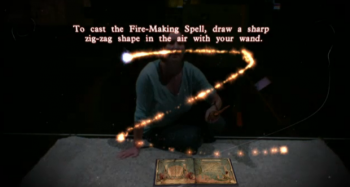 In order to cast a spell, you have to move the Move controller in a particular pattern as if it were your wand. Then a dragon leapt off the page and burned the book. Yeah, it was kinda hokey. I'm intersted in augmented reality, fantasy and new ways of story-telling, but watching the demo for Book of Spells had me wavering between too very opposite emotions. Cries of "Oooh, neat!" shifted to "Oh jeez..." very quickly. In any case, I will be excited to check out new fiction from Rowling this fall, and see if the WonderBook really is the wonder it sets out to be.